This is a marvelous and gemmy piece of Libyan Desert Glass weighing 17.8 grams and measuring 1.5" by 1.3” by 0.7". The scouring desert winds and sands have worn her smooth and she literally glows with inner light, almost seeming opalescent in areas. And inside are many, many perfect little inclusions of christobalite and outside, a few grains of Sahara sand. Her shape clearly testifies that she was molten at one point and you get lost in exploration of her undulating surfaces, perfect for finger or thumb places. 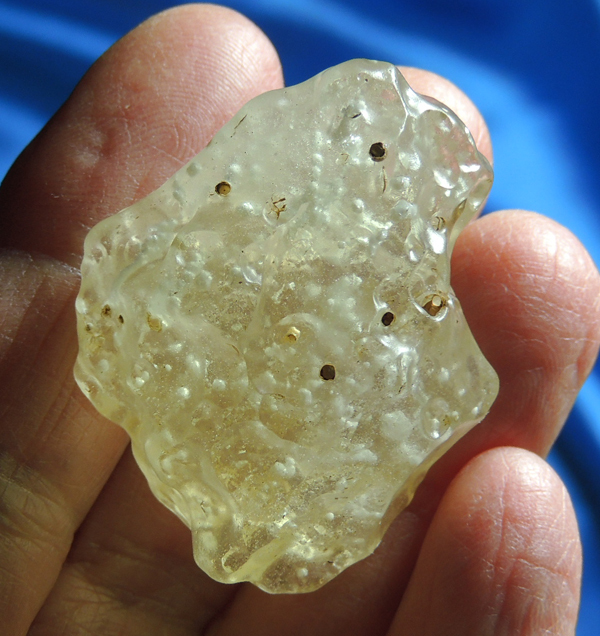 Libyan Desert Glass is a tektite, but with a difference. Discovered by the western world in 1932 by Patrick Clayton, they had been known to the ancient Egyptians; a scarab carved from this glass was found in King Tutankhamen’s tomb. The age of the glass is unknown and it is thought to be an impactite, in that it was formed from a meteorite (or some other force) that literally vitrified the sand. (Interestingly, the authorities have never found a meteor crater and are at a loss to explain what could have caused such high heat as to fuse the sand like this … ) LDG is almost pure silica with traces of iridium, proof of their extraterrestrial origin since iridium is the one element found on Earth not native to here. The largest LDG ever found weighed 26 kg and they are from the Great Sand Sea in northern Africa … gorgeous and sacred! When I first held my first piece of LDG, I was astounded – tears welled in my eyes and I felt like I’d found a long, lost friend. Indeed, she helps to more fully awaken within us, the light of our soul essence, a profoundly moving and comforting sensation. Her golden energy fills your aura and you feel more alive and aware, as if your radar had been turned on. I am struck with the manner that they enable you to connect with ALL levels of your expression. She is presenting herself for a special Keeper who is undergoing a Spiritual awakening and who feels like they are strangely out of step with this world. Although not truly a starbrary, she is a rare and wonderful connection to the stars, reminding her Keeper of ancient memories and distant worlds. My dear friend, Lynn, reports that she tried a Libyan Desert glass with a Prophesy Stone and was able to connect to Atlantis, observing the rituals of Solstice and Equinox when both were used to activate the total Chakra system and blend it with the Earth. These special and secretive ceremonies were taken from Atlantis by a few wishing to preserve the non-abusive use of crystals.